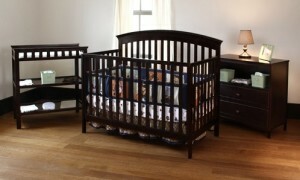 I was completely shocked when I found this beautiful nursery furniture set by Summer’s Infant at Walmart. 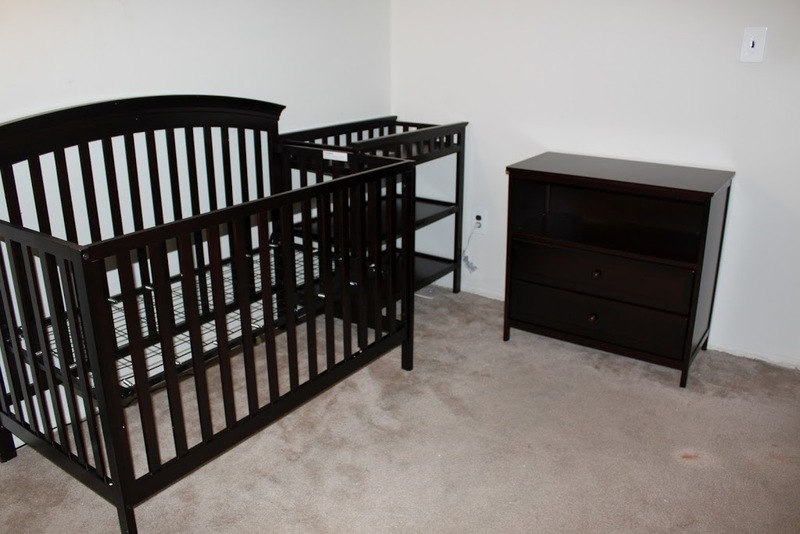 I admit I had to read the description about 5 times to make sure that I was understanding correctly that all 3 pieces, the crib, dresser, and changing table, were all only $250. I asked Andrew if he liked it and he said yes. We were both skeptical about the quality, but figured we had nothing to loose by trying it. I’m happy to say that we are beyond thrilled with our purchase. 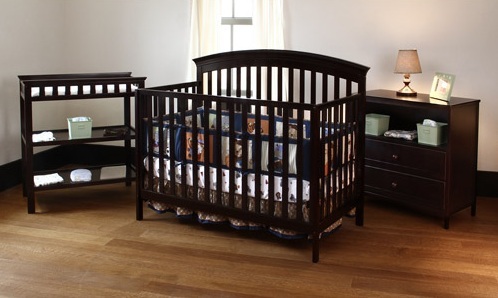 Summer’s Infant prides themselves on providing “The safest and most reliable products on the market.” They have been in business for the last 26 years and the company is named after the founder’s daughter. They are dedicated to building the “safest and most innovative products that stand the test of time”. All three pieces came in 2 boxes. 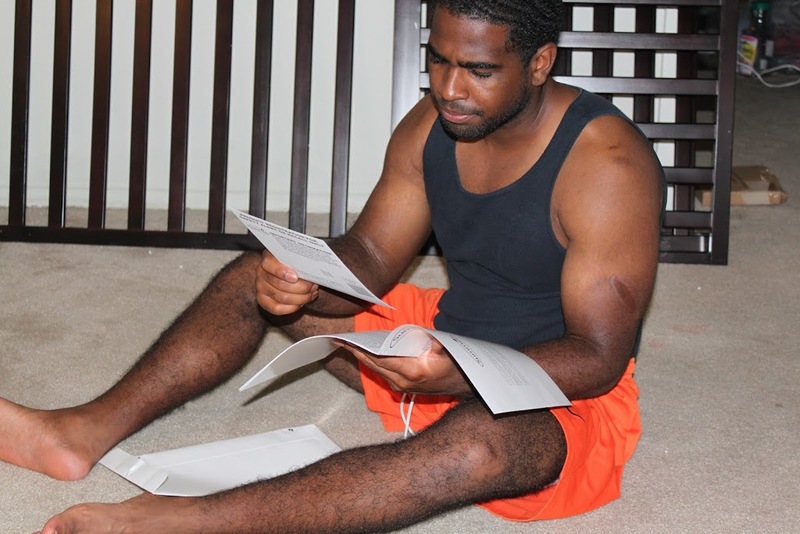 After Andrew took everything out of the boxes he began to look over the instructions. (I’m happy to say that he is one of the few men that will read instructions!!) He commented on how well written they were and that it seemed like everything was going to be pretty easy to put together. 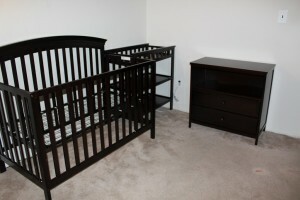 He started with the crib and then worked on the changing table and dresser. 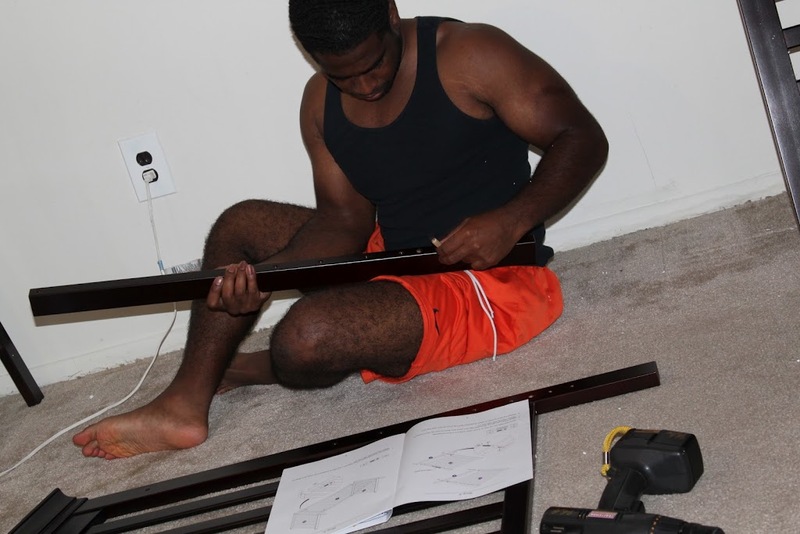 He said the dresser was the hardest thing to put together. And his only complaint the entire time was that while putting the back on the dresser if you over screw the back on, the wood bows a little. After a few hours, everything was nicely put together and we couldn’t be happier. We don’t have our bedding yet, so I can’t show a completed picture, but the furniture itself looks just like the one we saw on-line, if not better. 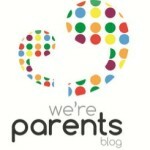 We can’t wait to use it all once our little one arrives! I was actually happy when I found out I was going to be pregnant in the summer. While yes it’s hot, it’s much easier, in my opinion, to dress. I get to wear flowing maxi dresses, shorts and tank tops, and longer shirts with leggings. 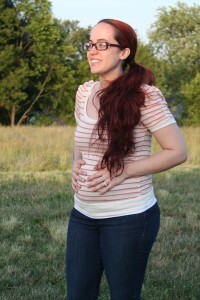 This has saved me a ton of money since I haven’t had to buy a lot of “maternity clothes”. Check out my money saving maternity clothing tips here. The problem with it being summer, is I feel the need to keep my toes painted. While, yes, I could easily go get a pedicure and have someone do it for me, but trying to save money, that’s not really an option for me. Luckily polish tends to stay on my toenails for a long time, so I don’t have to do it often. Last week, I got some super cute new purple polish and was dying to try it out. I’m only 24 weeks, so I wasn’t thinking I’d have to much of a problem. Boy, was I wrong. First, I tried to bend my knee to my chest, like I normally do. Not only was that uncomfortable to me, the baby must not have liked it because she started kicking me. What I found worked best was I brought out the ironing board and bent my knee to the side of my belly. Having the ironing board (you could also use a table) allowed me to not have to bend down at all and seemed to work. I’m pretty sure the next time I decide to change the color, Andrew will be painting my toes. (Shhhh….he doesn’t know this yet!!). When did you start having difficulty reaching your toes? Did/Does your significant other help you paint your toes? 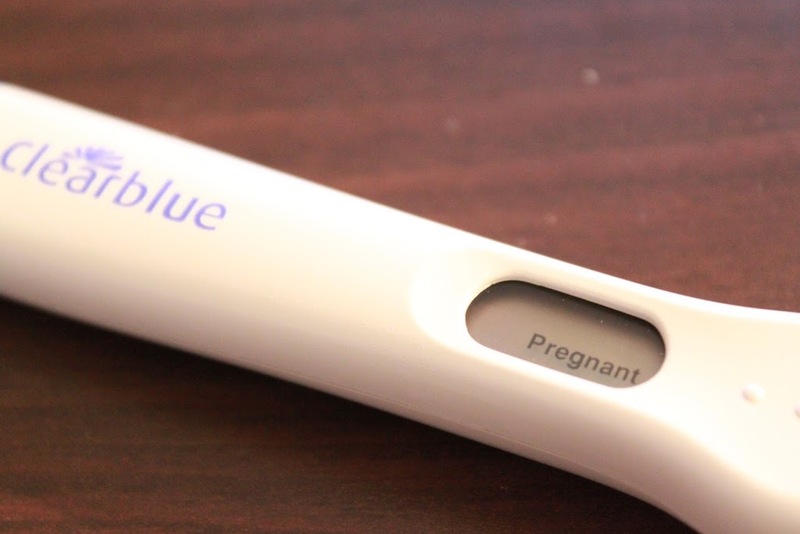 When I found out I was pregnant I was ecstatic. However, I quickly realized that my regular clothes were not going to fit for long. By just week 6 I couldn’t fit my thighs into a few pairs of my jeans or shorts. I was devastated. I didn’t think I could have gained weight that quickly and even more worried that if I was already outgrowing my clothes how much was I going to have to spend on a maternity budget. Determined to not go broke, I had to come up with some smart solutions. 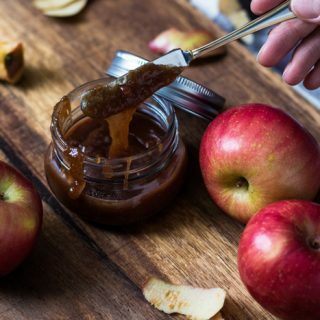 #1…Set a budget and stick to it. 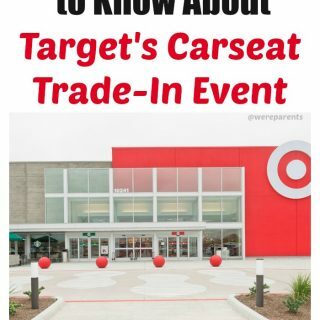 Before you buy it, ask yourself if you really need it (you should do this all the time, not just when shopping for maternity clothes). Determine what in your closet you can continue to use. You would be surprised how many dresses or longer shirts can be paired with some leggings and continued to be used your entire pregnancy. Buy a Be Band. I did a review on this product a few weeks ago and I’m happy to say, it’s probably the best investment I’ve made so far. I am still, at 24 weeks, able to use this product regularly. I never tried it, but you could always go an even cheaper route and do the rubberband trick. 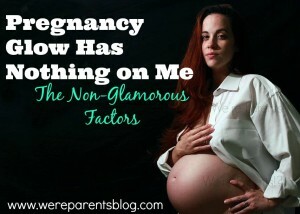 Don’t limit yourself to just “maternity” clothes simply because you are pregnant. Since being pregnant, I have only bought the Be Band new. I have bought 6 other dresses from the regular clothing sections of stores. The price on maternity dresses seems to be raised just because they are “maternity”. I found a maternity dress I liked in Target for $40, but went over to the regular dresses and found an even nicer one for just $25. The great thing is that I will continue to be able to wear this post-baby and feel better that it’s just a “regular” dress and I’m not still wearing maternity clothes. Just a regular dress I got at Target. 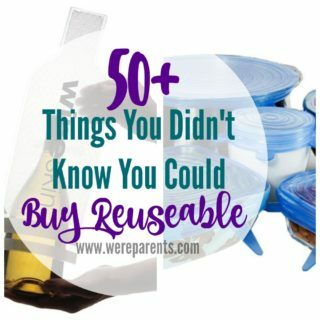 Ebay, craigslist, and facebook yardsale groups can be lifesavers. I got an entire box of maternity clothes for $40 off facebook, picked out a few pieces that I could use and turned around and resold the remaining pieces for almost what I paid for the entire box. Shop clearance racks at stores that have maternity sections or look at discount stores like Burlington Coat Factory. I was able to find jeans there for just $9.99. I even found a nursing bra on clearance for $3 and most other nursing bras were just $9.99. How did you save money on clothes while prego?? 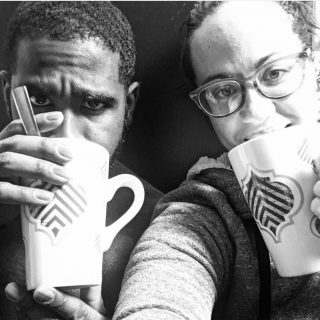 2. with both of us living so far from “home” and only 4 weeks apart in pregnancy, it didn’t make sense to have two separate ones. The most difficult part was choosing a theme and then coordinating everything to go along. We eventually narrowed it down to “Mommy to BEE” (a bumblebee theme) and “Ready to POP”, both of which we found a ton of stuff on Pinterest. We ended up going with the POP theme because my sister is already a mom, so it worked better for us. We changed the wording to “Going to POP” because I would only be 23 weeks and she would be 27 weeks at the shower (we aren’t quite “ready” yet). Unfortunately, running around, I didn’t get to take pictures of everything, but I will try my best over the next few weeks to get some more pictures and also recipes for all of the wonderful dishes we had. 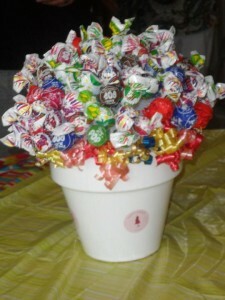 We had customized stickers made from Vistaprint that went on our LolliPOP tree, as well as tied around our favors. We used Bubbles as our favor (one of the thing I don’t have a picture of). We tried to think of as many things with the word POP in it for found, but essentially around round you can convert into something “POPable”. 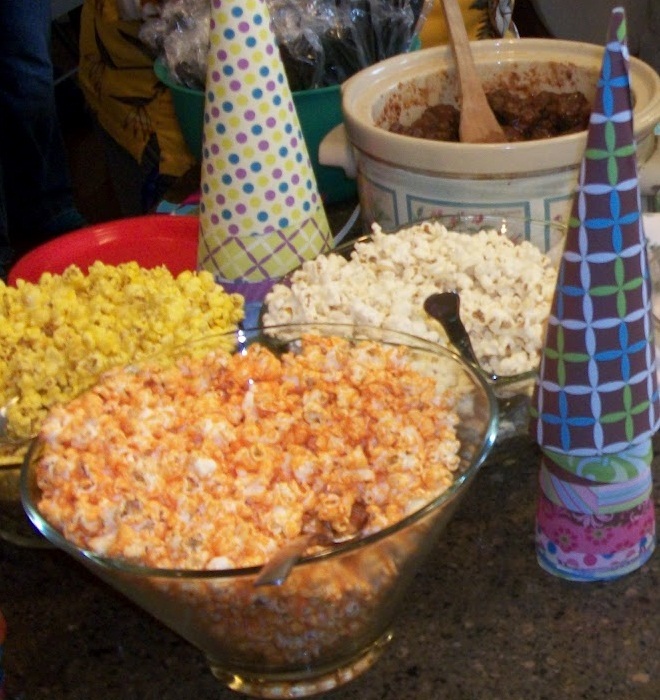 Our main food consisted of: Ham & Cheese POPable sandwiches, POPcorn chicken, POPable meatballs, and Pizza POPS. 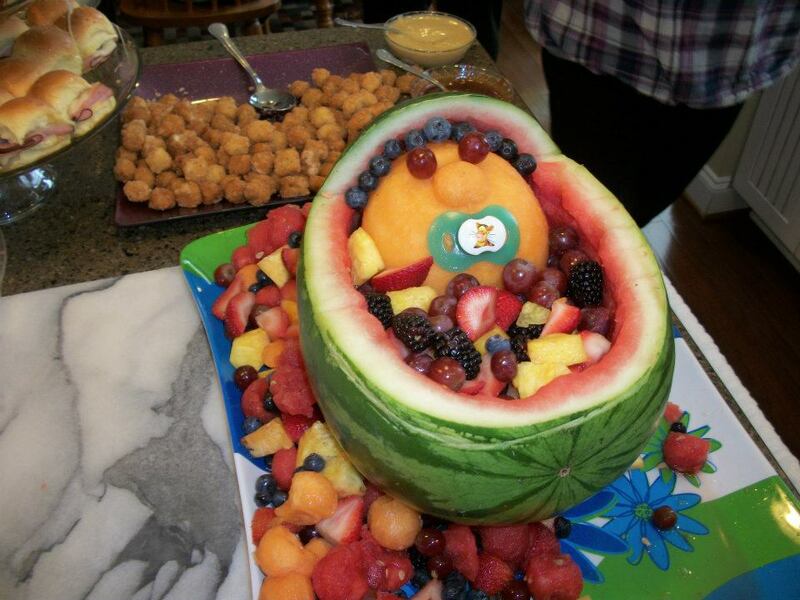 Additionally, we had some amazing desserts… One of my favorites was a watermelon cradle that we found on Pinterest and Andrew actually carved out. He added blueberries for hair as his own personal touch (I loved it). We said this was POPable fruit. 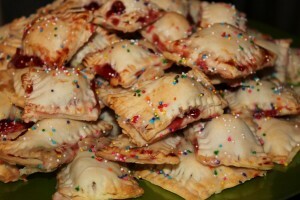 We also made homemade POPtarts. These were simply amazing. We filled them with cherry or apple filling and they were just so cute. 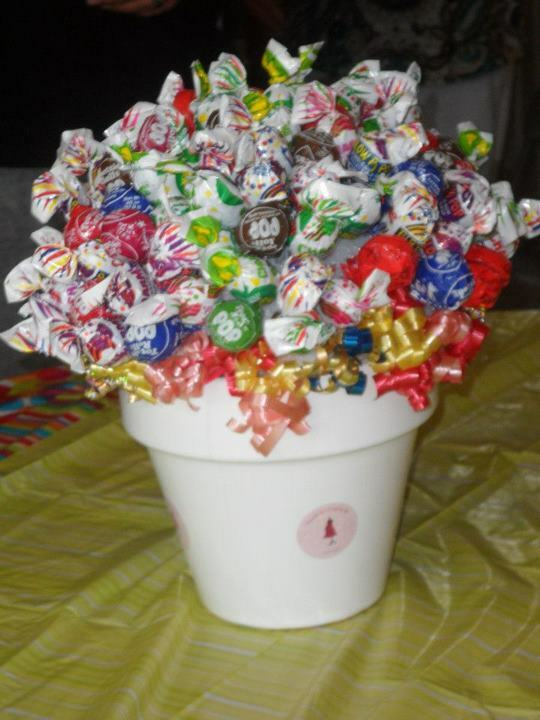 We also made a LolliPOP tree using tootsie pops and blow pops. We also had Oreo Dipped Chocolate POPs that I wasn’t able to get a picture of yet.Lastly, we had a small popcorn bar. I blogged about making these adorable scrapbook popcorn cones a few weeks ago and it was a success with the kids! We did our entire shower for about $300 and it was a huge success!! Be on the look out for upcoming recipes and money saving baby shower tips soon! 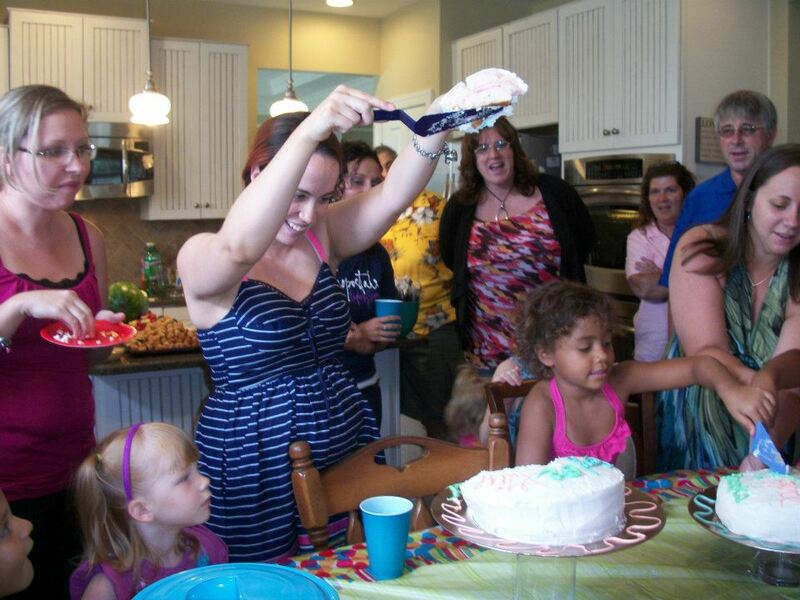 When my sister and I first decided to have a joint baby shower together back home, one of the things we really wanted to do was a gender reveal. We both thought it was such a such cute idea. What we didn’t realize it that not only were people going to want to KILL us, but keeping the secret would be so hard! 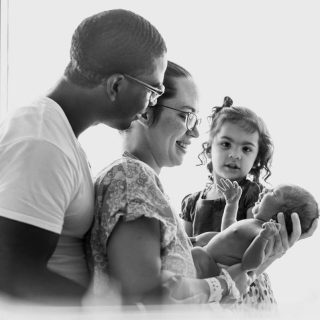 For the most part, we kept it a secret…I slipped and told my mom about a week after I found out, even though I continued to deny I ever slipped until the reveal and my sister very noticeably slipped the day before the baby shower, also to our mom. The most difficult part was deciding how to do the gender reveal. 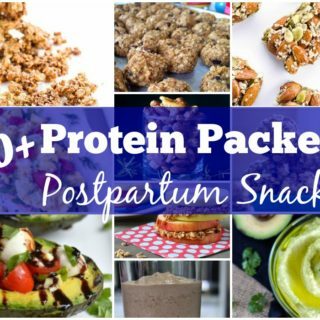 There are tons of ideas on Pinterest, but we decided to go two different ways (and thank God we did). First, we had decided to do a reveal cake. Essentially you do a layered cake (we did 9 inch round cakes) and between the 2 layers you put either pink or blue icing. We went we a buttercream icing and used food coloring for dye. 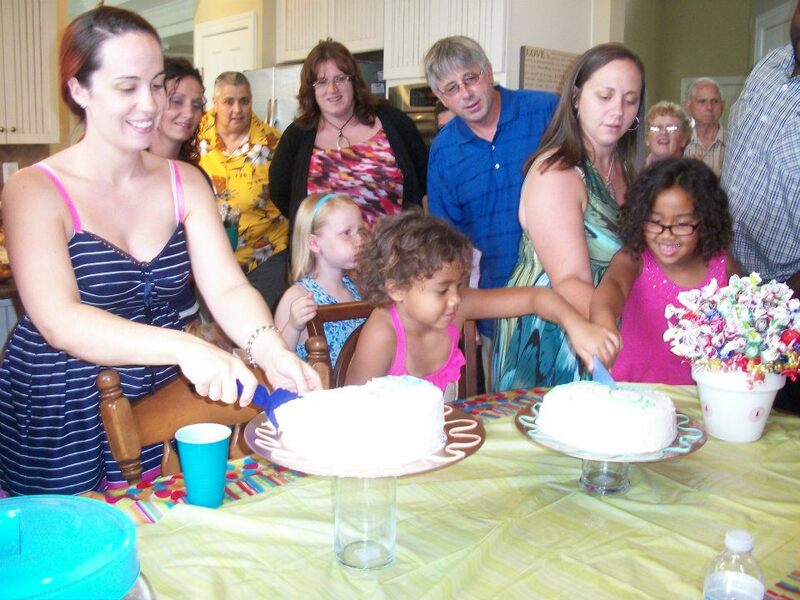 We cut into our cakes with everyone around…. And revealed that both of us are having girls!!!!! (sorry it’s hard to see the pink in the pic). A few days before the shower we decided that since there would be a lot of kids at the party (this was very much a family affair) we could have the kids to the reveal. We took black balloons (you can use any dark color that you won’t be able to see through) and put pink confetti in them. The idea was that we would go outside and have the kids play a game to see who could POP the balloon first and reveal the gender by having to Pop them by only using their butts. (**sorry I don’t have pics of the balloons since we weren’t able to do this). Luckily, we continued to go with the gender reveal cakes as it decided to rain the day of the shower and we weren’t able to go outside. While we could have done it inside, I don’t believe the clean up would have been as fun!! 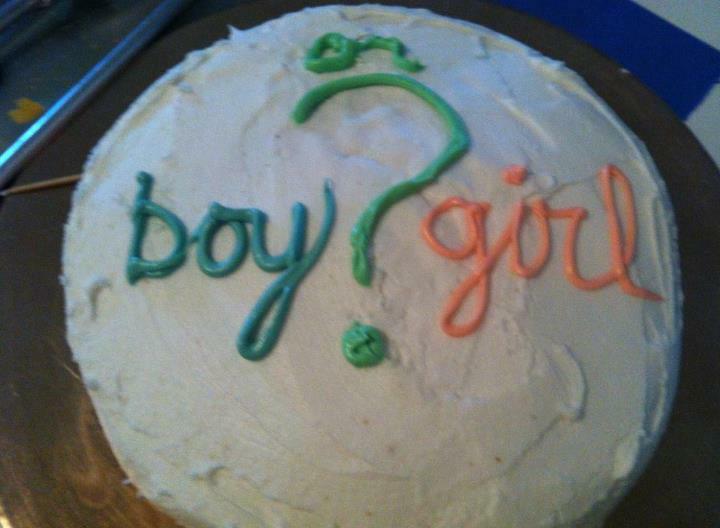 Did you do a gender reveal?? How did you do it? Little did I know…God had other plans. By this point, I was already pregnant. 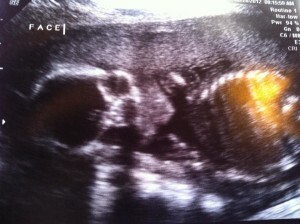 I found out Tuesday, March 13th that I was expecting. My sister and I both had plans to go home to West Virginia for Easter, so I decided to keep it a secret until then. (It was excruciating trying not to say anything). Luckily, I could get a some relief by telling Andrew’s family. We usually go over there on Sundays so we could tell them then. Little did I know, they too were keeping a secret. Andrew had been planning to propose to me for awhile and a few weeks before all of this, he and his parents went and bought my engagement ring. 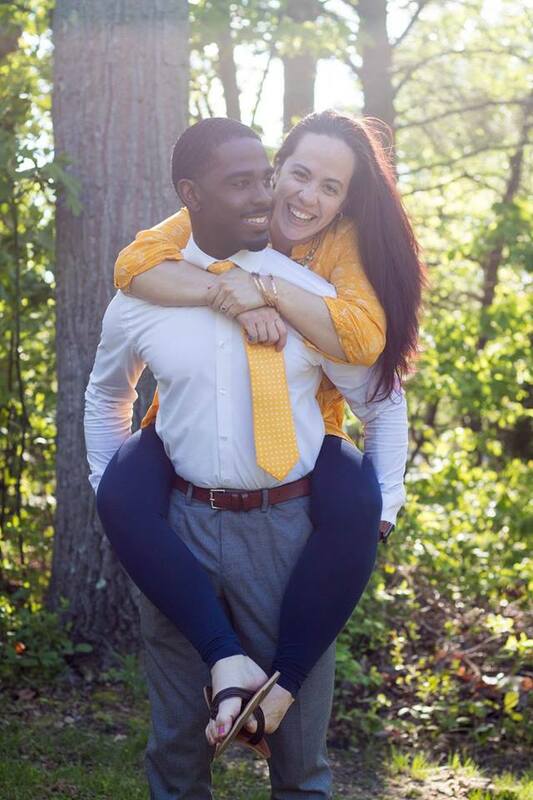 He proposed on the 17th….obviously I said yes. It was such an amazing week. I knew he was hesitant about telling his family so quickly after we found out. I tried to think of a neat way to tell them, but that’s not “his style”, so I decided to just go with the flow and if he wanted to tell them he would…if not, we would wait. We walked in the house and everyone (mom, dad, and his younger sister) was in the kitchen. His mom was doing his sister’s hair. We were just talking about random stuff going on, when someone brought up something about a baby. For the life of me I can’t even remember what was said because it happened so fast. The next thing I knew…Andrew burst out…”Wellllllllll….speaking of babies…..” Then his sister, “OMG, You’re pregnant.” Everyone was so excited. It was great 🙂 This is their first grandchild, so I know the baby will be unimaginably spoiled. A few days before Easter, my sister told me that they wouldn’t be coming anymore because of various reasons. I was so upset. I really wanted to tell her in person. I waited another day before I just couldn’t hold it any longer and I blurted out that I was expecting. After numerous “no ways” and “are you serious(es)” she realized I wasn’t joking. My iPad app said that at 8 weeks the baby would be the size of a jelly bean. Perfect I thought for a way to tell everyone since it was Easter weekend. I handed my mom her “present” and a card. She opened the present and saw a bag of jelly beans. She looked at me funny b/c she doesn’t even really like jelly beans that much. She then opened the card which read, “Congratulations, these jelly beans represent the current size of your 4th grandchild”. She immediately looked at my sister (who she already knew was expecting) and said “OMG YOU’RE HAVING TWINS”. We all burst out laughing. My sister said, nope guess again! She looked at me and said OMG, You’re pregnant! She couldn’t believe. Later we all went over to my dad’s house and while we were hoping for somewhat of the same reaction, as soon as we walked in someone asked my oldest niece about her new sibling and she blurted out that her TiTi (me) was also pregnant. Spoiler alert. HAHA. On the day of Easter, we went over to my aunts house. My mom thought she would pull the same trick on the family that I pulled on her. So she’s eating jelly beans and asks everyone what else could be the size of jelly beans. My aunts and cousins all takes guesses. Beans, peas, etc. She said what about my 4th grandchild. Again…everyone turned to my sister and said TWINS!!! Nope guess again. They all got this very confused look on their face before almost simultaneously saying, “LARISHA!! !” There was so much screaming and excitement I don’t know if anyone actually spoke any words, but needless to say there were all excited.